The final weekend of racing in this season’s CSC NE Monsoon Sailing Festival kicked off with a solid 4 races for most classes, leaving sailors bruised and battered at the end of day 1. some boats suffered more serious problems, with a start incident resulting in the retirement of Jong Dee & Arbudhen from Race 2 and subsequent races. This coupled with Brio snapping their rudder, Madfish II snapping their spinnaker pole, a grounding from Arbudhen, beach catamarans getting stuck on moorings after launching, wild spinnakers and a few other things made for an exciting and interesting day for all 23 boats participating. After 4 races, Red Rum finds themselves in an unfamiliar situation, sitting 1 point ahead of Waka Tere at the top of the fleet in the IRC Class. They secured 2 bullets and 4 line honours in the fresh North-Easterly Breeze – made easier with a strong crew outfit. Invictus struggles to break into the top 2, with their best finish being a 2nd in race 4. They now sit in 3rd, 4 points away from Waka Tere. Damage to Jong Dee in the start of Race 2 made it an unexpectedly short day for Paul and crew, despite a stellar performance scoring a bullet in Race 1. Citing the lack of experienced crew after today’s disappointment, Born in Fire will attempt to rectify the issue and look to climbing up the IRC standings in the remaining 3 races tomorrow. Scoring 3 bullets from 3 races left Southern Light in the driving seat, as Skipper Leslie Sharpe relished the idea of a victory to complete a successful return to Club Racing for Southern Light. Trailing by 4 points is Minx, who are in the running for the overall Sailing Festival PY leaderboard. 2 points adrift is J24 Balqis, whose performance placed her on the podium after 4 races, comfortably 4 points ahead of 4th placed New Blue Eyes. With 3 more races and potential reshuffling due to the activated discard tomorrow, sailors have everything to play for on day 2! Favourites Arbudhen called it an early day after the start line incident resulting in damage to her boat and Jong Dee’s. In the Cruising Multihull Class, only 1 point separates the top 3 boats – setting the stage for an exciting finish for Kaze, Dash Two and Jaza Two tomorrow. Scoring 2 bullets puts Kaze in the driving seat, but Damien faces a tough challenge from 2019 Trimaran Champions Dash Two and fierce rivals Jaza Too in the remaining 3 races. It was not all happy thoughts as AbracaDeborah gave up on Race 4, succumbing to fatigue – leaving it to Witblits to complete the fleet in 4th. 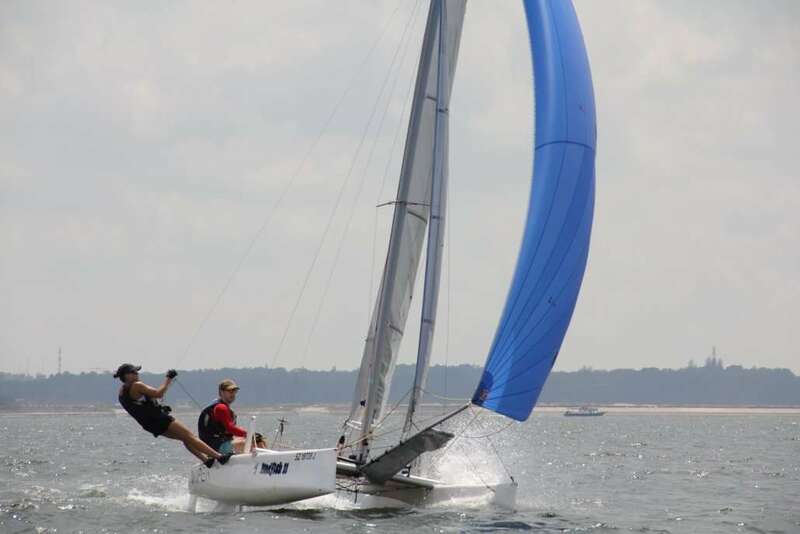 After 4 races today, Bad Influence leads the Beach Catamaran fleet with 7 points, amidst broken spinnaker poles and unwarranted crashes with boats on the moorings. Favourites Madfish II snapped their spinnaker pole in Race 2, forcing them to retire for Race 3 & 4. A consistent performance by Nacra 15 skippered by Uli Braun place him 2nd and 1 point ahead of Madfish II in 3rd. Despite being the only Weta Trimaran in the fleet, The Blue Bug was sporting to participate in all 4 races, and CSC is very appreciative of that! All in all an eventful day 1 of the SailFest Regatta 2019, looking forward to an exciting conclusion over Day 2!